Companies spend millions of dollars to find, attract and hire the best talent. They also spend the same amount of money to find, attract and hire some pretty untalented people. That is, hiring is a huge business expense and plenty of companies are getting very very wrong. What companies usually get wrong is that they focus on and optimize around the wrong things. Whether it is because they are taking lessons from marketing, because marketing is directly influencing recruiting thinking, or because recruitment marketers are leveraging consumer marketing tools, there is a gap. Consumer marketing focuses on quantity, attempting to expand the number of consumers to ever-greater numbers. In recruitment marketing, the focus is on quality instead of quantity. 99% of the time, you can only hire one person for that opening, so your job isn’t to attract a million prospects, but to attract 2-3 great ones. This is why content is such a key (and commonly overlooked) tactic in recruitment marketing: content doesn’t scale as quickly and easily as ads and job boards do. Telling the story of a job will often repel candidates (likely poor-fitting ones, anyway) as often as it compels. Ads are designed to appeal to a wide audience and avoid giving that audience a reason to not take action. This waters down the message in a space where people are choosing whether or not they should change their lives. But first a simple definition. Content marketing is any content that encourages or induces action. Everything else is up for discussion. For recruitment marketing, the ultimate goal is applications by likely fits, but there are a lot of things to consider in the process of building content. Hence, the framework. When I first started sketching out this framework, the biggest part was where to start, both for myself and for the audience. You really could start at three other places on this framework with a reasonable chance for success, but in the end I started here simply because it was the safest part of the entire framework. Safest? Yes. My assumption isn’t that i have to convince you that this works, but get you to convince your boss that it works. The best way to get that to happen was to start in a place you already know: what your business does and who you need to hire on a structural level (not a fit level or anything like that.. yet). You already know who you need to hire: an IT support person, a nurse, a customer service team member, a marketing manager, an mid-level account person, a factory floor manager, a director of whatever. We start here because this is what you already know you need. Everything will get added in as we go along. Yes, But do we really need to worry about career area? This is something I’ve thought a lot about in the last few months as we developed this framework, and my opinion flipped a few times, I admit. In a lot of ways, you can ignore it. As we’ll see in later sections, there’s a case to be made that understanding the career stage is more important that career area. And the rules and thinking behind your content is the same for every role. But the framework is a means of focusing thought, to quickly figuring out what you can ignore and what you must include. And if that’s the case, career area is important. Nt just because the motivations behind those roles are so different, but because people, more than anything else, want to feel understood. If you were looking to hire IT staff, would you sent a nurse to recruit them? Of course not. Not because a nurse couldn’t understand what IT does (they can), or understand the motivations to help people without getting a lot of glory (trust me, they can). You don’t send a nurse to talk to IT recruits because an IT prospect will want to feel like you understand them. Sending someone who speaks their language is one way we do that. Starting with the career area means we an draw a more clear picture of who this prospect is, which lets us figure out what this prospect wants, which leads to compelling content. The marketing world has always leaned on the concept of the marketing funnel as a means to consider the consumer mindset as they moved through the consumer journey. From buying cereal to cars, we all follow the steps from unaware to action. The same holds true for people considering applying for your jobs. Start start not knowing your exist or not knowing jobs exist and they follow the path to applying. Between the top and the bottom of that funnel are a handful of major stops, but they can occur across a universe of websites and information. The map above is a non-comprehensive suggestion of how complex that journey can be. Some people will simplify this funnel into two main ideas: attraction and consideration. Later on, these questions will shift to worrying about what the experience of working at this job is like and if it will support the prospect’s career goals. If you asked a hundred people what they want most in a career and their next job, you’ll likely get one hundred answers. But you can group those hundred answers into eight major types of answers. These are the primary motivations for job seekers. They aren’t mutually exclusive, so someone might be mostly motivated by Status and Performance. 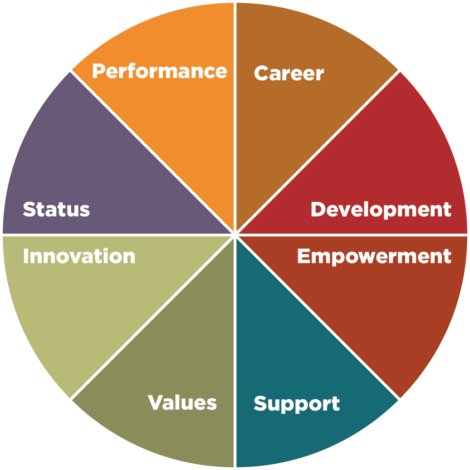 These motivations are somewhat related, so it isn’t surprising, but it would be unusual to find someone motivated by Career (which tends to focus on compensation and advancement) and Support (collaborative work styles and work/life balance). What’s interesting is that these are also the eight core focuses of a brand or job. That is, Goldman Sachs would want you to know that they are all about status. Yes, they have salary and benefits, but the reason one might choose their firm over others is that GS is usually consider “the top.” At the same time, someone might work for a B Corporation because of their focus on values. Again, there might be status and salary involved, but the primary reasons someone chooses a B Corp is because it is a company that has values baked into its charter. Within a company, different departments and roles may attract differently motivated people. For example, few people join sales teams for the values and few people join HR teams for the innovation. A good fit starts where an applicant’s motivations and the company’s reason for being match up. Sadly, companies, because they hate the idea that a talented prospect walk away despite being a poor match, will attempt to appear to all motivations. Imagine a non-profit that touts its salaries and you can see how trying to appeal to all motivations can’t work. Classically, these are the core purposes of what content can do. It can educate, inform, entertain and inspire (sometimes short-handed as EEII). These goals are not mutually exclusive, but they further tighten the writer’s focus to content that leads to action. Where these goals help is to help remind the writer to focus on the reader and not the organization about which they are writing. Companies are the worst kind of narcissists, with huge teams of people devoted to taking any line of information or inquiry and turning it back to the company’s perspective. Think of all the articles written about how company X won this award or that award. This is corporate ego, speaking very little to the prospect. If the goal for highlighting these awards is to make the prospect feel like their work at this company will likely win awards, this is inspirational content, a different beast that your standard “we won the XYZ award” press release on most career sites. If you have job titles that are obscure or unusual, you need to build content that informs the reader about the job and educates them about what that role might entail. Otherwise, prospects might not know if your Marketing Manager reports to the CMO and requires years of expertise or if its an entry-level role. Finally, content can entertain. Not that you would guess that from most career sites. I’ve always found it interesting that brands spend big money for art (stock or custom) in which employees (or models) are smiling, but the copy reads like dour washing machine instructions. Sure, perhaps your brand isn’t very funny, and perhaps you pride your brand on its button-down attitudes (see Brand Considerations). But those companies are few and far between. Do you have office happy hours? Do you have a staff outing (and does it resemble something closer to “fun” than an “all-hands meeting?”)? Have you heard the occasional chuckle down the hall during a brainstorming session? Then maybe your career site should reflect that level of humor. It can be done without calling the attention of the lawyers and corporate fun police. 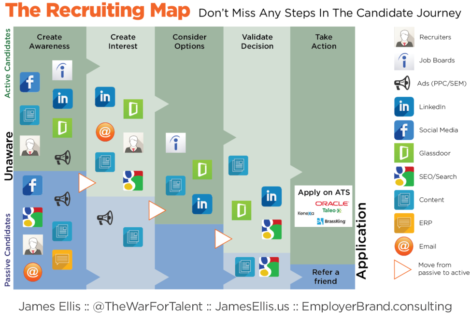 This element of the framework is specific to the recruitment marketing space. 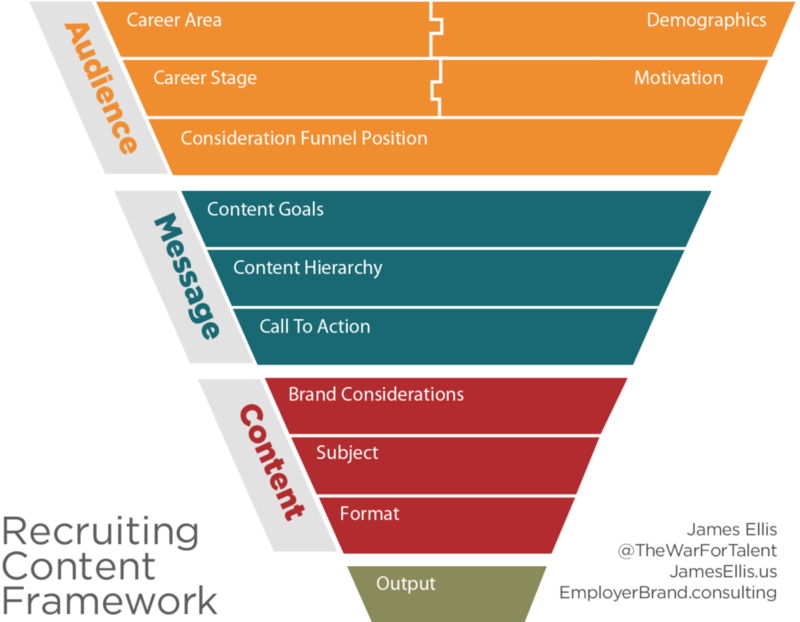 Taking some notes from Maslow’s Hierarchy of Needs, this is effectively the Hierarchy of Recruiting Content. Why a hierarchy? Because if you try to build content at a given stage without explaining the stages leading up to it to a prospect’s satisfaction, the content will lack resonance and credibility. For example, if I read content about an amazing job with teammates and employees dedicated to the completion of a goal, I might be excited to apply (as it pushes a lot of my personal job triggers). But if it turns out that the job is in the suburbs of Chicago (location) and isn’t easily train accessible, it’s not a job I can apply to because I live in the city and don’t have a car. Or if the brand is a company I despise for political or personal reasons, I’ll be angered that I got excited about a job working for people I will anticipate hating. Many companies think they are already answering those questions with a job description, but as the diagram below shows, they do not. Note that I said that the content has to explain each stage to the prospect’s satisfaction (not the brand’s satisfaction). A job description, with its vague coded language, rarely satisfies anyone. When we talk about location, the brand might assume that listing the city or even the address is enough to satisfy the stage, it really doesn’t. What I want to know about the location is how close to a train stop it is. I want to know if I can bike or walk there. Some people might want to know what restaurants are close for lunch, or if there’s a decent place for coffee, or how close day care options might be. None of these things are ever in a job description. 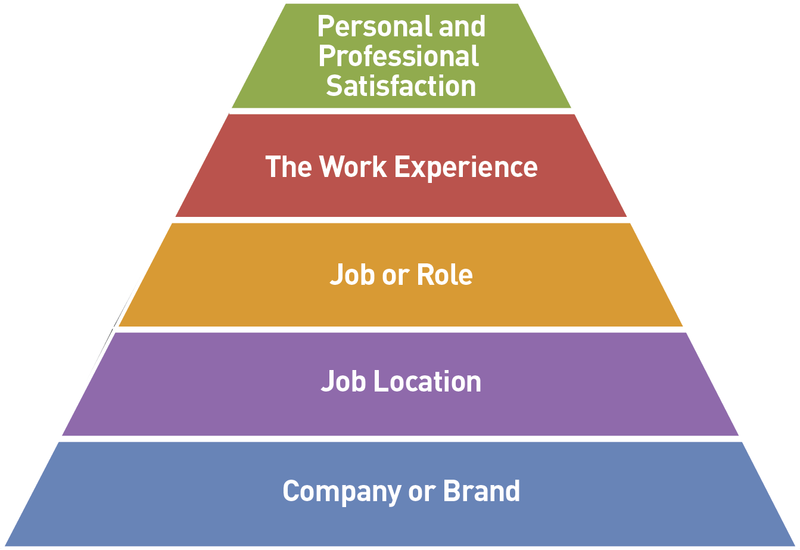 Why is the “personal and professional satisfaction” stage aspirational? Because its almost impossible to write content designed to fulfill this stage. This stage is fleeting, depending so much on the reader’s state of mind as much as the quality of writing. Have you ever heard someone claim to be funny? That’s an impossible claim. Either the listener thinks that the speaker is funny or they don’t. In many ways, this stage is achieved by executing all the previous stages properly and completely – as the prospect reads multiple stories and forms a picture of the brand and what working in that role might lead them to. Remember: content marketing is all about inducing or encouraging action. On most career sites, that takes the form of three major tasks: apply for a job, contact a recruiter and join a talent pool. There is a fourth action that is commonly implicit on the site: read more. A mistake in most recruiting content is that it assumes that content with a well-fined audience and a focused message will automatically create that action. But that simply isn’t true. Every book on how to look for a job has at least one page (if not a whole chapter) on asking for the job. The same holds true on our side of the table: don’t forget to ask people to take that action. This is why the call to action exists: to connect compelling content to a meaningful action. Think of a specialized middle-manager role you are trying to fill. The job description requires 7-10 years experience in the subject matter and 2-5 years experience in management. This suggests that you are looking for an experience dual-threat, not an easy find. Now, let us assume your amazing content begins to give a qualified prospect a compelling reason to apply. But obviously the prospect wants more information, either from your site or somewhere else. But every time they look for information, you’ve got that big flashing button demanding they apply. If your recruiter behaved that way, you’d probably fire them. Content should be an invitation to read more content, consumed like potato chips, one after the other until the prospect is sated. Only then will they consider applying. But if you’ve badgered them enough, they will simply leave (remember the threshold for leaving is a simple click). So consider where in the funnel your content exists and what kinds of applicants it is speaking to. Is this content the beginning of the process or should it be starting to close? That thinking will dictate the call to action. It is customary to start by defining brand using the Bezos standard: Your brand is what people say about you when you aren’t in the room. I’ll add my own as-yet-unnamed corollary: Your employer brand is what people say about you when they aren’t on the clock. That said, there are things you do every day, consciously or not, that influence, establish and define that employer brand. Are you a suit-and-tie kind of company? Do people bring their dogs to work? Quiet or cacophonous? Offices, bullpens or mostly remote work? Collaborative or competitive? 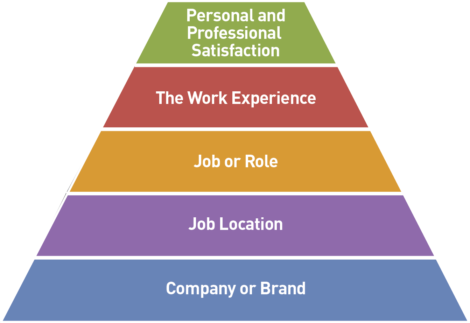 Those attributes and feelings make up your employer brand. How you express them in your content reinforces them to a wider audience, one that may not have any other information about your brand. If you’re a top brokerage house, you likely thrive on intense interpersonal and inter-team competition. If your content attempts to reflect a more collaborative environment, it won’t align. More accurately, it will gut and hollow out the intended message. At this stage of the content creation process, you should have a firm understanding of who you want to talk to and what message you want them to hear. The brand element forces you to marry these external thoughts to the cold reality of who you work for.